The video market is in a state of flux at the moment. Consumers want to capture footage but not necessarily by way of a dedicated video machine. Samsung's new HMX-U20 range wants to remedy this. Adept at both taking still images and filming video footage the device is being touted as an ultra-compact camcorder. The UX20 has everything you would expect from a cam that's taking on the Flips of the world. There's a built-in USB connection which means that you can upload and share your videos at some speed. The USB also means that you can recharge the U20 using any computer, which is a bit of a boon. To cope with both video and stills capture, the U20 has been given a1/2.3 inch CMOS sensor. 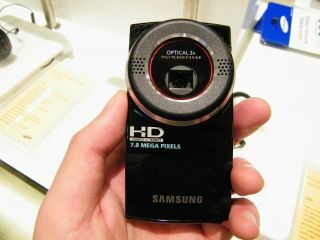 With this you can shoot 1920x1080 full HD resolution video (30p / H.264) and you will also be able to shoot up to 10MP images. The version of the U20 we had a fondle with shot only 8MP stills, but you can upgrade this to 10MP if you want to. To appease the photographers, Samsung has also added a 3X optical zoom to the camcorder – which means that you don't have to digitally manipulate the image if you want to get a bit closer to the action. To view your shots and to see exactly what you are filming there's a 2-inch LCD on the back. We would have loved this to be AMOLED, like the company's camera range but the U20 is for those who are careful of their budgets and this tech is still rather pricey. To help those out who have shaky hand syndrome, there's also something called Hyper Digital Image Stabilisation on board. Other features include a time lapse recording function which allows users to program the camcorder to record at a pre-set interval of one image every one, five, 10 or 30 seconds. It's not the most useful of options but if you want to recreate the film Smoke, you can now do so. As with the myriad compact cams on the market, there's also the a one-touch YouTube upload facility which pushes the U20 straight into the hands of students and those who want quick, sharp shooting on the go. Portability is definitely the key the U20's USP. With dimensions of 2.1x.61x4.09 inches, the camcorder is definitely on the compact side. The HMX-U20 has a UK release date of March, with pricing to be announced. Also available is the HMX-U15, which has a 1x optical zoom but a massive 14MP in the image stakes.